t~icrogravity research, a new field originating from the accessibility of space, has reached the age of adolescence. An impressive set of results has emerged from the fi rst Space 1 ab fl i ght, whi ch by now has been fully evaluated. In view of this and the wealth of information available from other space experiments, ground based research, and short-term microgra- vity experiments in ai rp 1 anes, rockets or fall towers, it was felt that the time was ripe for a comprehensive review of the field. The initiative of the US to build a permanent station in space, which was soon followed by a European decision to join this venture, further focussed attention onto microgravity materials sciences. This originates from the interesting prospects of a commercial space uti 1 ization, which would heavily rely on the results of scientific or technical experiments in space. From this point of view it also seemed timely and essential to provi de prospective commerci a 1 users with the necessary i nformat i on on previous experience, and more importantly, with a sound scientific basis for space processing. 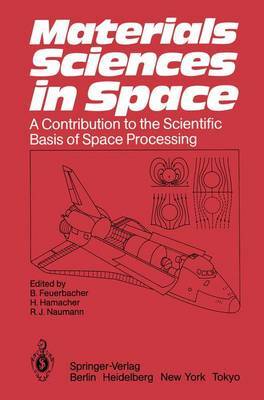 The aim of the present volume consequently is twofold, namely - to stimulate new scientific experiments in space in order to expand our knowledge gained from microgravity research, and to provide industry with the information obtained from space experi- ments sofar and to contribute to the scientific background for commer- cial space utilization.